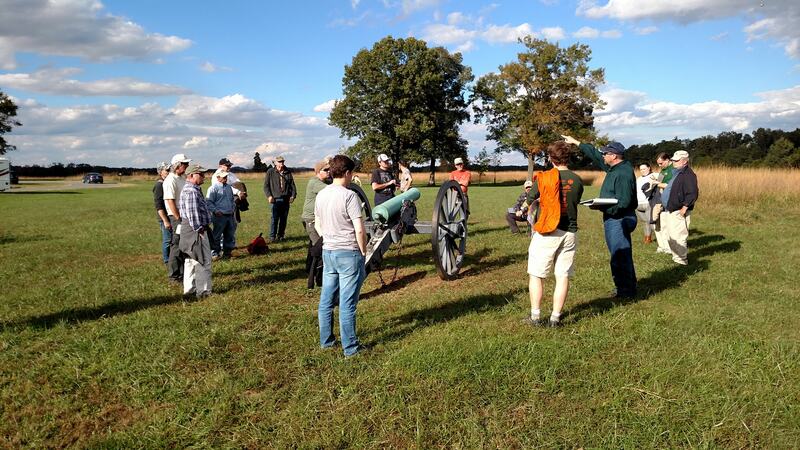 Any of you who were on the Bull Run Artillery Tour this past October should head on over to Craig Swain’s To the Sound of a the Guns for this article on artillery tactics. Heck, even if you weren’t on the tour you should check it out. 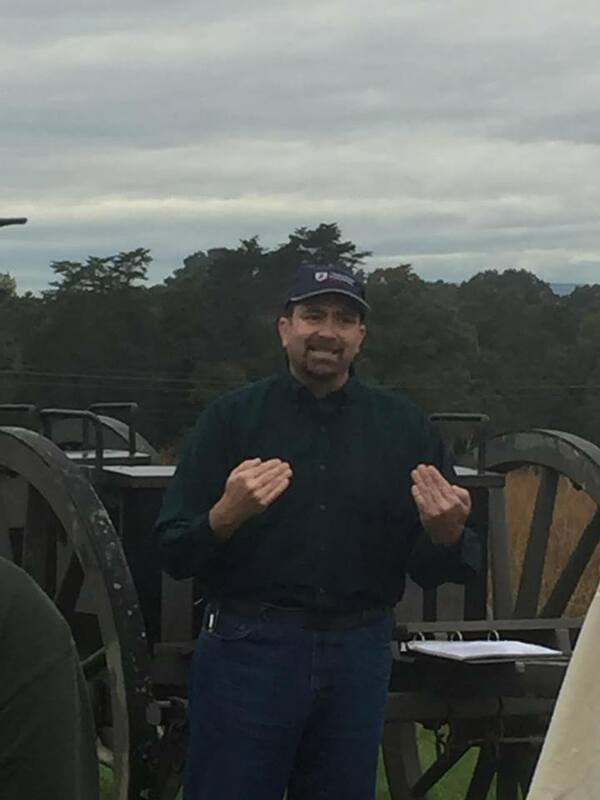 On Saturday, October 20, 2018, about 23 tourists (I think – my muster sheet slid down a storm drain in Winchester, VA on the way home…really) formed up outside the Manassas National Battlefield Park visitor center for a tour of the use of artillery at the First Battle of Bull Run. 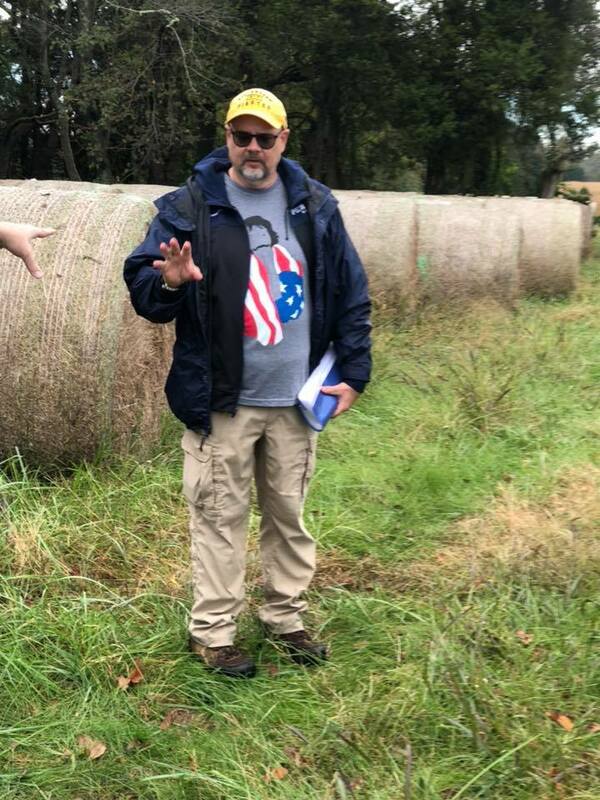 This was the third of what I hope will be many battlefield tours I’ve organized and will organize through this site, and I took a bigger role in guiding this one than I did in the first two, but the real artillery expert on hand was Craig Swain of To the Sound of the Guns. Craig and I really focused on laying this one out (we even used an OUTLINE!) and I think it turned out great. We even finished on time! In brief, our format from stop to stop was for me, through the use of after action reports (AAR), letters, memoirs, and congressional testimony, to describe how the actors got to that spot and what they did there. Then Craig went into the deep detail of artillery tactics and use, gun production, and options available and not available. For that last bit, Craig provided graphics exhibiting elevations and ranges of what could and could not be seen (and therefore possibly struck) from various positions on the field. 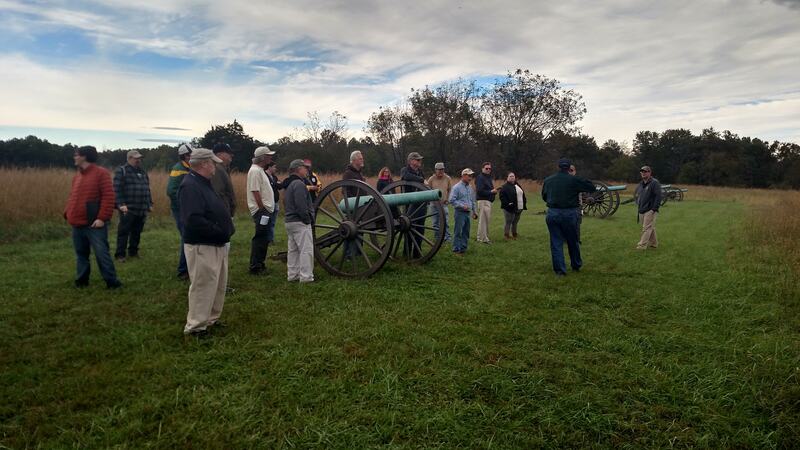 We didn’t cover all the artillery involved, and focused on the Federal batteries of Griffin, Ricketts, and Reynolds and the Confederate batteries of Imboden and those comprising Jackson’s gun line. Next stop was Reynolds’s guns on Henry Hill. 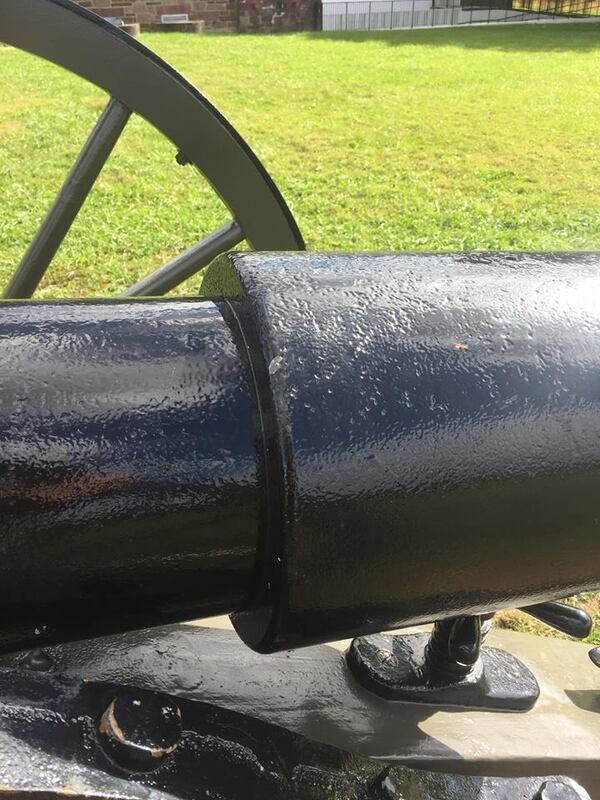 I read from a letter by a member of the battery, , and Craig described the notion of a Napoleonic “artillery charge,” the “staying power” of guns on line, and fire effect on infantry. Then we went somewhere I had not been before, Dogan’s Ridge, which was the first position of Ricketts’s and Griffin’s guns. I covered the stories of Griffin and Ricketts, and then Craig broke out the graphics and discussed line of sight, training, projectile and fuse selection, and other position options available. 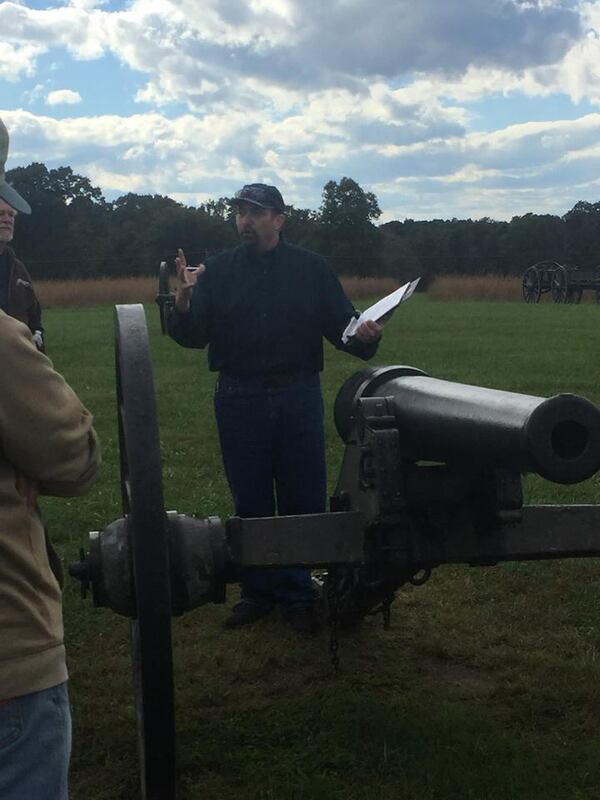 I really enjoyed this part of the tour, and am pretty sure not too many artillery tours of First Bull Run have covered this spot. It’s a cool place with a great perspective – you should go there next time you’re at the field. We move from the John Dogan house (not the wartime house) toward the first positions of Ricketts and Griffin. 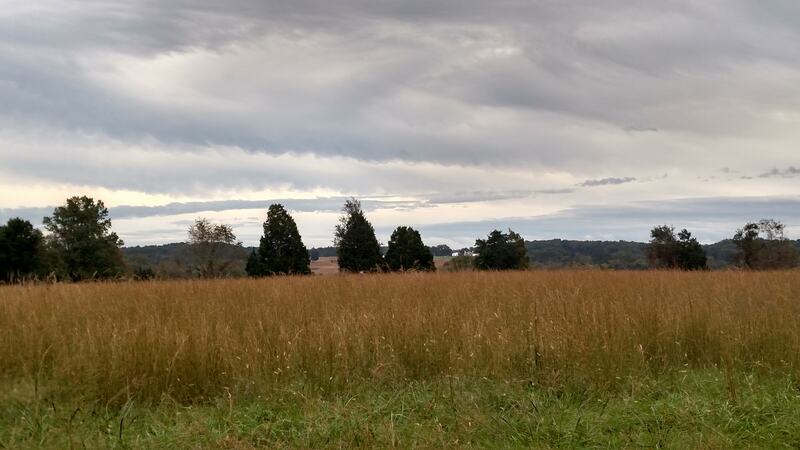 After breaking for lunch, we reconvened on Henry Hill and walked to the wayside marking Imboden’s guns. 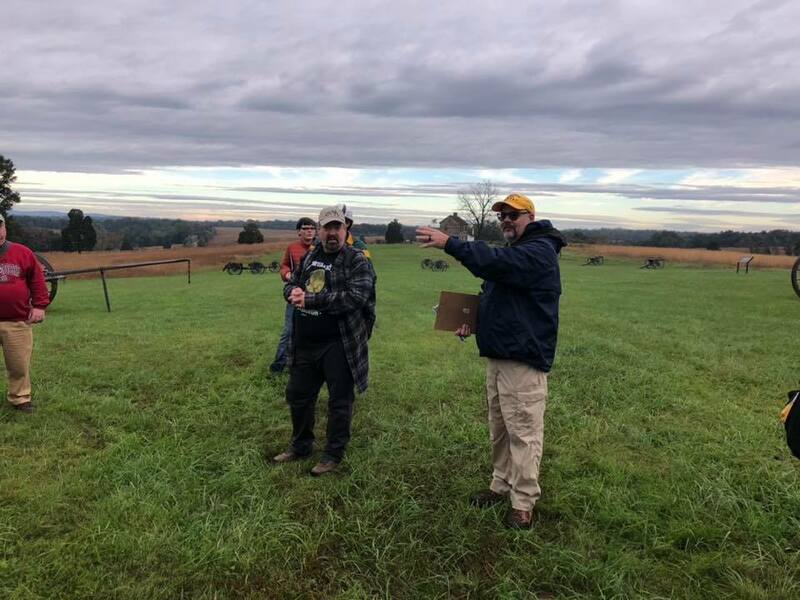 I read from Imboden’s wonderful report (the full report you can find here, not the truncated version in the Official Records) and from a rejoinder published by Clark Leftwich, who commanded the two guns of Latham’s battery that were north of the Warrenton Turnpike. Then Craig discussed counter-battery fire and the effectiveness (or ineffectiveness) of rifled guns. 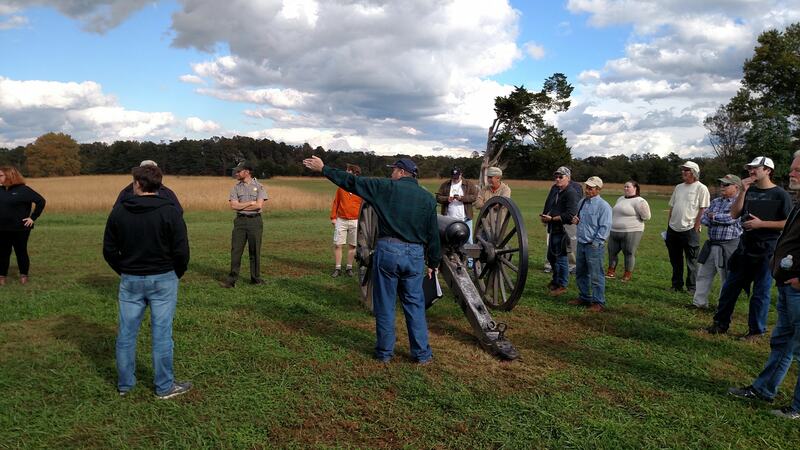 Then we took a walk to Jackson’s gun line. This was the longest walk of the day – there wasn’t a whole lot of walking on this tour at all. Lots of stuff covered here: on my end, accounts from three AARs, one letter and one post-war memoir (everything I read from on this tour is right here on this site). Craig went into the use of masking terrain, massing artillery, and yes, the intricacies of James Rifles. I’m sure the attendees dreamed of James Rifles for days afterwards (I know I did). 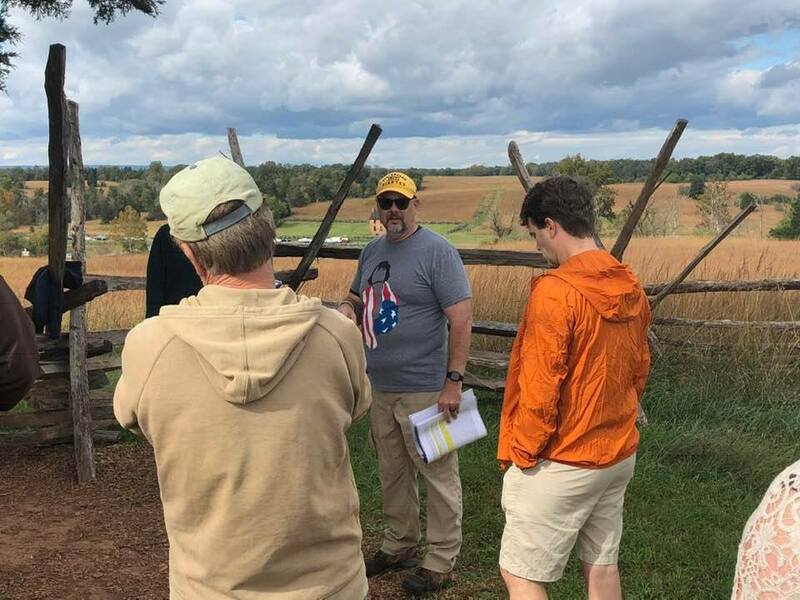 It was also here that we were joined by Manassas National Battlefield Park Superintendent Brandon Bies, who stayed with us for the remainder of the tour. 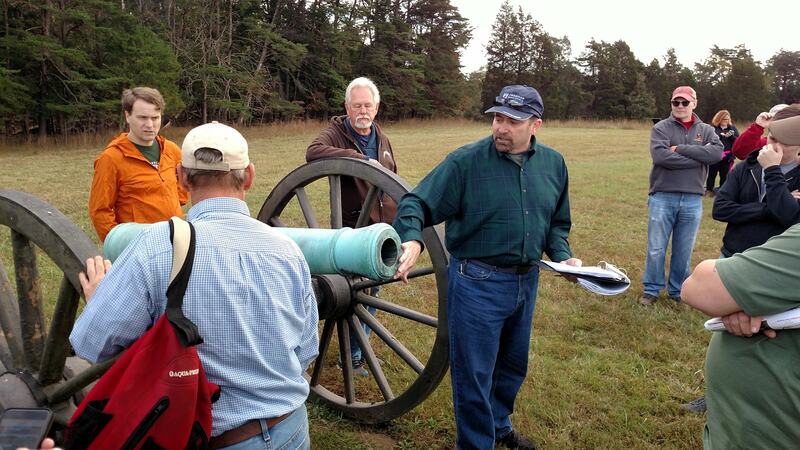 Craig explaining the make and model, and probably what the foundry foreman had for lunch the day the gun was cast. 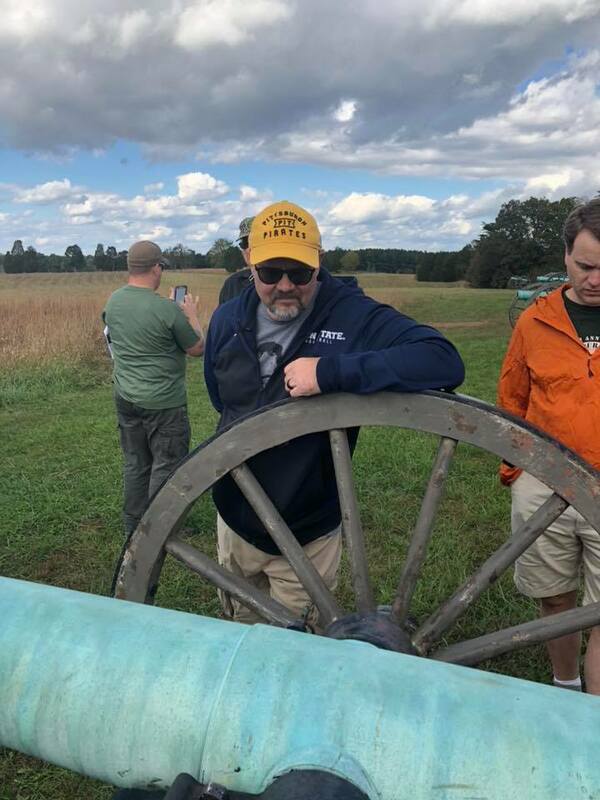 We returned to Ricketts’s gunline, and Craig discussed infantry support and what said support was supposed to do, and the relative advantages and disadvantages of rifled versus smoothbore cannons. Supt Bies also discussed a new artillery adoption program to provide for cannon refurbishment. I completely forgot I had material to discuss here, but remembered by the time we made it to the next stop and presented Ricketts’s and Griffin’s JCCW testimony and Griffin’s AAR again, as well as an interesting 7th Georgia account of the capture of Ricketts. 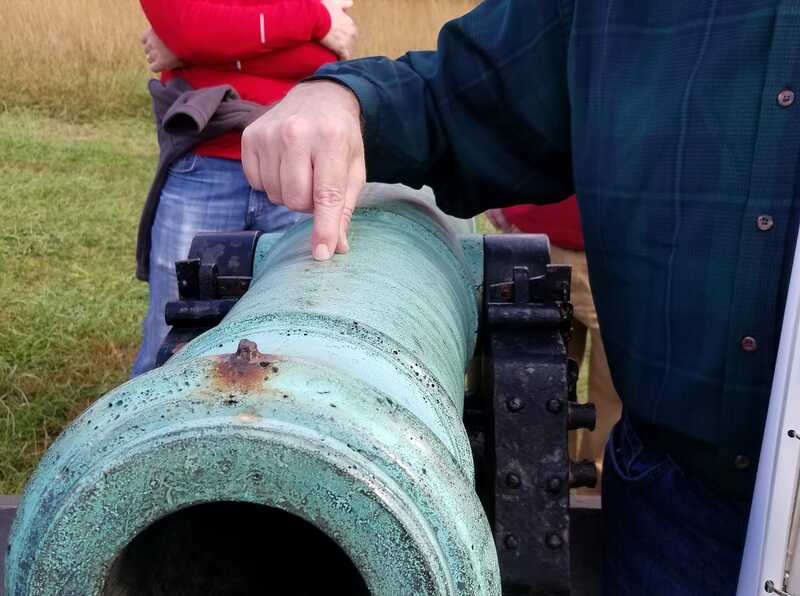 Craig pointing near one of Ricketts’s (representative) guns. MNBP superintendent Brandon Bies in uniform. 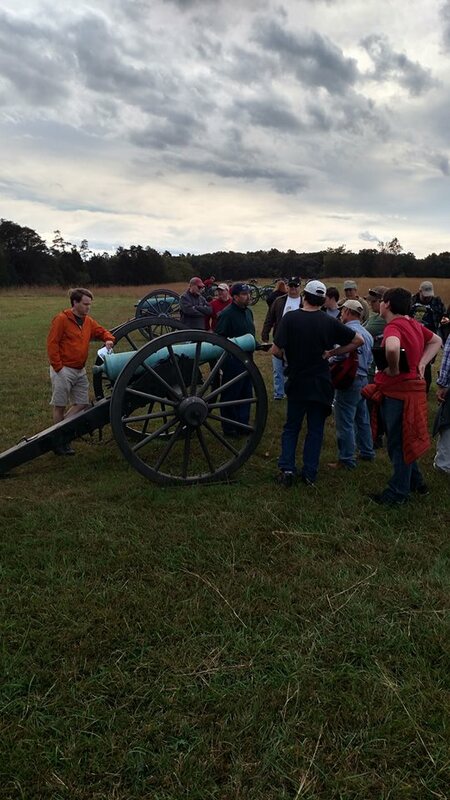 Our last stop was at the famous section of Griffin’s guns that he detached and sent north. After making up for my mistake at the prior stop, I covered Griffin’s report and testimony once again. Craig discussed oblique fires and what to do when your battery is overrun. 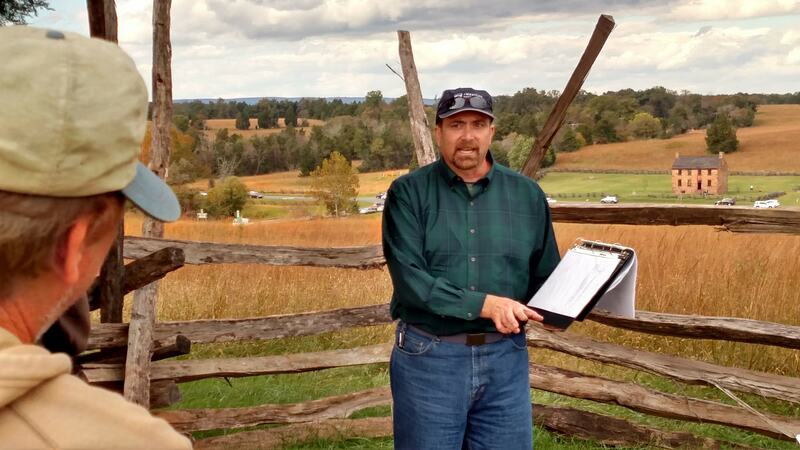 He also talked about reforms in the use of Federal artillery in the wake of First Bull Run. Craig making one last point at Griffin’s 2 gun section. I think a great and educational time was had by all. We can of course conduct this tour again if demand is great enough. One lesson I took away from this tour was that there is absolutely no relation between the number of people who say they are definitely attending a tour, or who say they are interested, and the number who actually show up. None. At. All. Thanks to everyone who turned out. Sound off in the comments here with reflections, complaints, or suggestions. 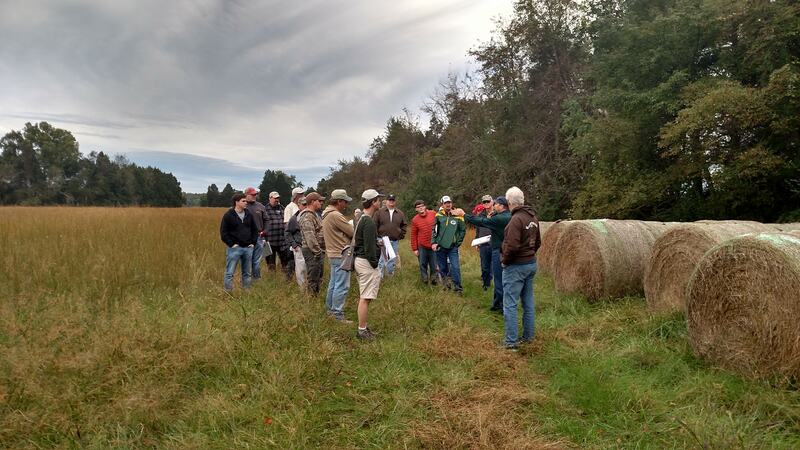 Our next tour will be held on either May 4 or May 11, 2019. It will be epic. Stay tuned. Craig and I are working out the mechanics of the tour, and this one looks pretty simple. Just a reminder on logistics. This is a free tour – you get what you pay for! 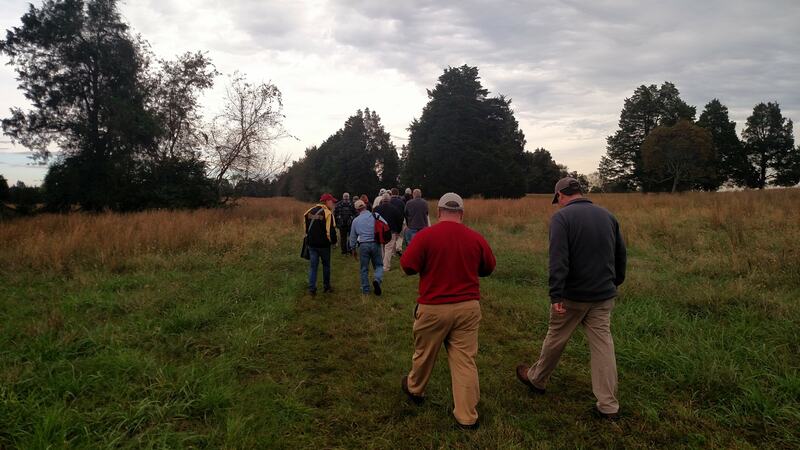 We’ll meet at the Manassas National Battlefield Park visitor’s center at 9:00 AM. Remember, it’s rain or shine. Dress appropriately. Boots are recommended. Even though it’s late October, tick spray is recommended and shorts are discouraged. Umbrellas are discouraged (can’t hear over the pitter patter), however guides may use them – they have to keep their powder (papers) dry. We’ll have one crossing of Sudley Road – not sure yet where or how we’ll do that. I’ll have more on that later. 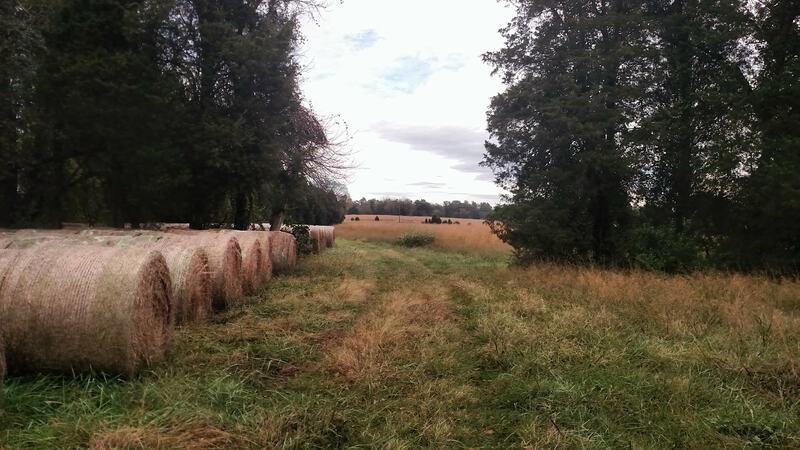 Walking will be moderate, over rolling terrain. But we’ll be standing still for periods, so if you want to bring one of those little portable stools, feel free. Lunch is ON YOUR OWN, and brown bags are recommended (driving to and from a food joint, and getting served, takes time and we’ll move on schedule). Keep an eye out for digital handouts. We won’t be providing paper handouts. Printing or downloading them to your device is your responsibility. Don’t forget the reading list! UPDATE YOUR STATUS ON FACEBOOK. Failure to do so may result in sending you to THE UPSIDE DOWN!!! 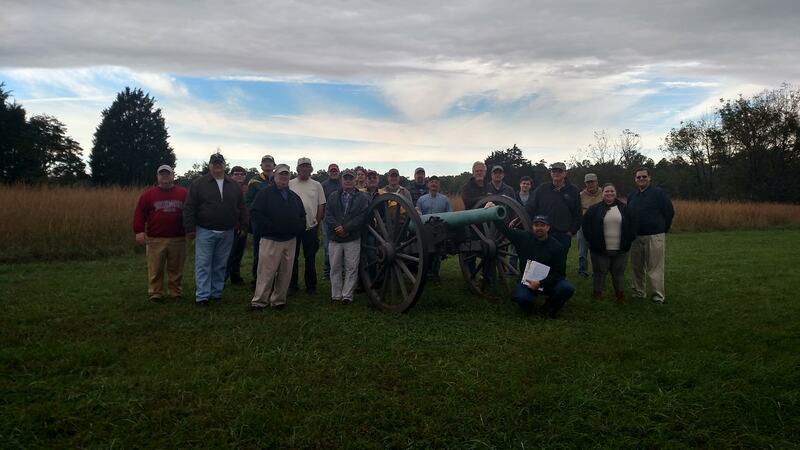 Well, interest in the upcoming Bull Run Artillery Tour with guides Craig Swain and myself has thus far been very strong. It’s hard to tell from these numbers, but folks “interested” and “going” on the Facebook Event Page exceed 500. I do ask that if you’re sure you’re going or sure you’re not going, and have clicked the “interested” button there, that you update your status. This gives us an idea of how to plan for this thing. Craig has provided a reading list for the tour. You should at least look at the bare minimum he suggests, that being Dean Thomas’s Cannons: An Introduction to Civil War Artillery. It’s quick, dirty, and cheap. Hazlett, James C., Edwin Olmstead, and M. Hume Park, Field Artillery Weapons of the Civil War; Ripley, Warren.,Artillery and Ammunition of the Civil War. Instructions for Field Artillery, 1861 version… though the 1864 version is acceptable, as it basically adds the technical aspects of rifled guns. Part I, Article I is probably sufficient for most in the audience. But browsing through the rest is advised. The Ordnance Manual for the Use of Officers of the United States Army. This is the “technical manual”. Don’t recommend a deep read, just be familiar with the table of contents. The Artillerist’s Manual by John Gibbon. This is a “tactics” manual, published in 1860, and consolidating a lot of “conventional wisdom” of artillery in one place. 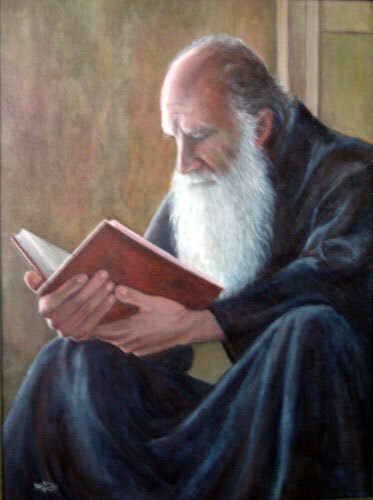 Recommend a browse reading. The “other one” – Major Frederick Griffins The Artillerist’s Manual and British Soldiers’ Compendium…. Not of direct importance, but an example of the professional reading that was out there as of 1861, and which was used by men like Hunt, Gibbon, Barry as reference material. OK, now get to work. There will be a test after the tour. 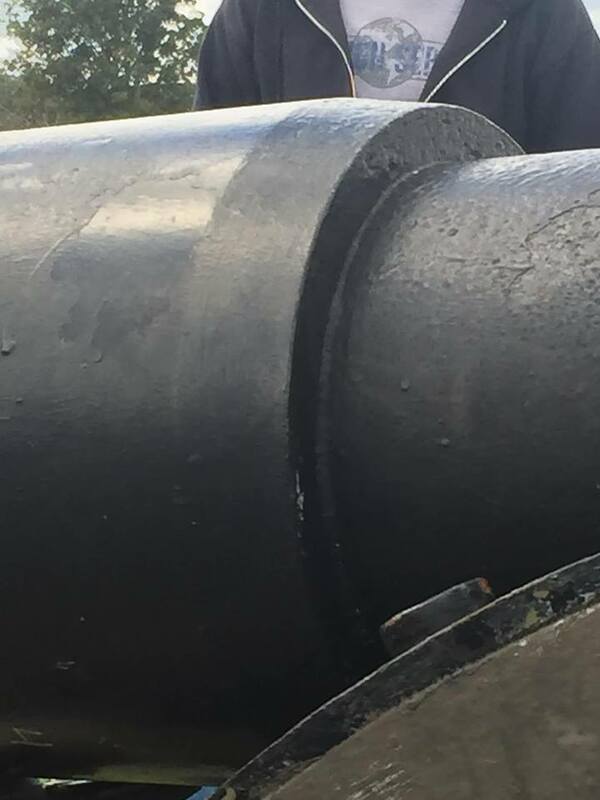 Well, if you haven’t guessed by Brick Tamblin’s statement above, the topic for the next Bull Runnings Battlefield Tour will be – artillery! 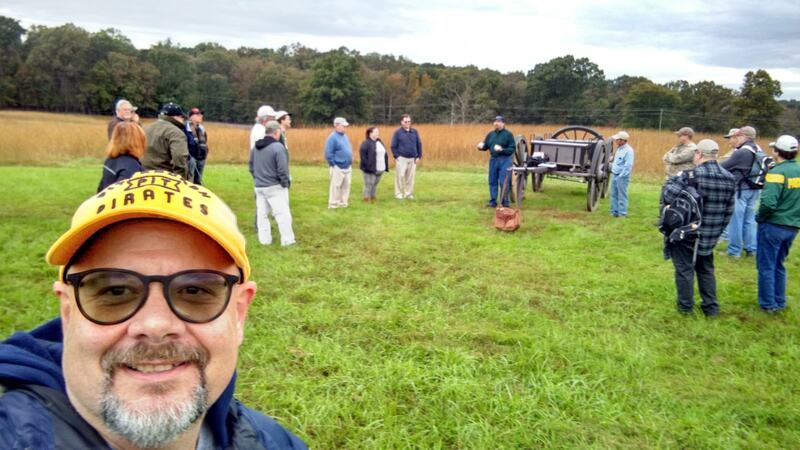 If big guns are your bag, you won’t want to miss a day at Manassas National Battlefield Park retracing the steps of the Union and Confederate artillerists during the First Battle of Bull Run with widely regarded expert Craig Swain and your humble host, me. Same game plan – no fees, everything is on your own (food, lodging, transportation). We’ll meet up at 9 AM on October 20, 2018 and head out onto the field. Dress appropriately – tour is rain or shine. Craig Swain is a graduate of Westminster College, Fulton, Missouri, with a BA in history. Commissioned in the Army after college, he served in Korea, Kuwait, various overseas postings, and finally outside Savannah, Georgia. After leaving the Army, he continued his studies at Missouri State University. He is author of numerous articles appearing in Civil War Times, America’s Civil War, Artilleryman, and other magazines. His blog, To the Sound of the Guns, covers various aspects of the war, but with focus on artillery and the Charleston theater of war. Craig is presently an information technology consultant, working in Washington, D.C.
I’ve set up this Facebook event page where you can express your interest in attending, or you can leave a comment here, or you can send me an email at the address to the right. Keep an eye out hereand on Facebook for updates, reading lists, handouts, and other fun stuff.